It was a joy to watch the last Total Lunar Eclipse of 2011. In fact, it would be three years later before we could see a Total Lunar Eclipse again. My husband and I arranged with some friends to watch the eclipse at Jurong Lake Park near our place. We were blessed with clear sky where we were able to see the process of the eclipse over the peaceful water of Jurong Lake. Several other people were there at the park waiting for the eclipse too. We started late, at about 9pm when the moon had already been partially blocked off the sunlight by Earth (We should have been there at 8.45pm). 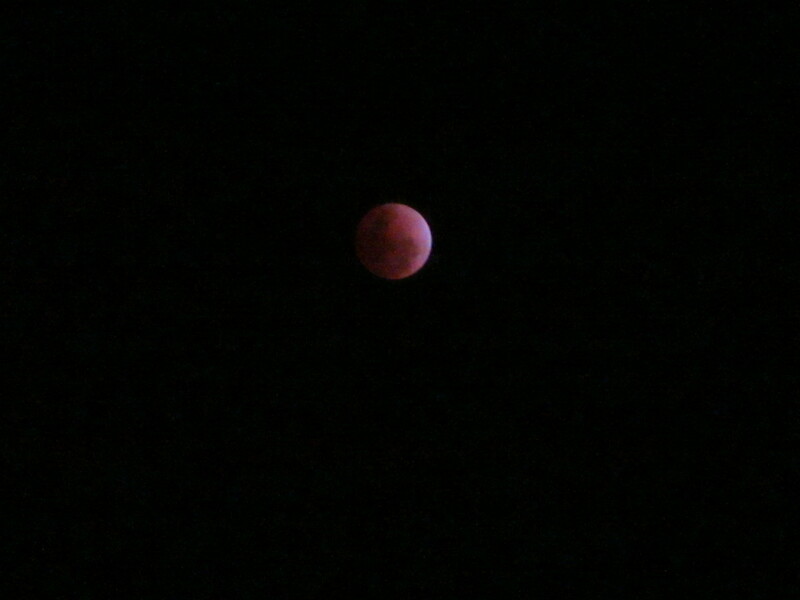 We sat through 1 hour plus of observation, discussion and photo-taking and by 10 plus, the full eclipse occured. It was a delightful feeling to be able to witness this phenomenon. We sat staring at the red moon which had then looked, in my friend’s words, appeared like a 3-dimensional planet sticker stuck oddly and unfamiliarly in the sky. It almost looked fake. I suddenly felt phenomenal as well when it suddenly crossed my mind that we were now exactly between the paths of the moon and the sun. We were in the half of Earth which had the privilege to witness this special event. Half an hour later, we went home to discover on Facebook that so many of our friends across Asia had been viewing the eclipse together. It was a wonderful feeling that I am for once, not moon-watching alone, even though this was , in my husband’s words”, a “Once in a red moon” affair. To learn more about the Total Lunar Eclipse, you may check out this site.